THE VATICAN (ANS — May 02, 2017) — The Supreme Court of Pakistan has turned down the request for an early hearing of the case of a Catholic mother sentenced to death for blasphemy, that her supporters and rights activists hold hard-line Islamic lobbyists responsible for. 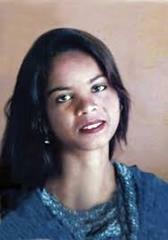 According to Vatican Radio (http://en.radiovaticana.va/news) Chief Justice of Pakistan Mian Saqib Nisar on April 26, declined a request for the hearing of the case of Asia Bibi in the first week of June made by her Muslim lawyer Saiful Malook. ‎“Today I have been informed that the plea was declined by the CJP,” Malook is reported to have told The Express Tribune. “This is very unfortunate. Her husband became quiet when he heard the latest developments. We shall again apply for the hearing and keep struggling for justice,” Joseph Nadeem, executive director of the Renaissance Education Foundation told UCANEWS. “There are many factors at work behind the slow pace of judiciary. Her case has been in the doldrums due to huge pressure. There will be a strong reaction if Bibi is freed. Opposing groups have made it a matter of honor and ego,” Nadeem said. Vatican Radio reports The Renaissance Education Foundation has been supporting Bibi’s family in Lahore since she was imprisoned for allegedly defaming Prophet Mohammed in 2009. “If Bibi’s death sentence is upheld, she would be first woman in Pakistan to be put to death for blasphemy,” the group said. Vatican Radio says analysts consider Qadri’s 2016 execution a litmus test for processing blasphemy-related killings. Now, in the view of Bibi’s former attorney, the current environment in the country is not conducive for the dispensation of justice in her case. “Our plight is that the socio-political atmosphere of the country has no space for discussion on blasphemy laws. The judges know what is happening outside as non-state actors show their strength on the roads demanding death for Bibi,” said Naeem Shakir, a Christian lawyer. “The sensitivity surrounding blasphemy laws has made it a political tool to threaten and put down others. The state has a weak narrative regarding this law and its functionaries usually try to evade questions regarding its misuse,” he said. Meanwhile, several Islamic clerics have renewed calls for the execution of Bibi, saying incidents such as the recent lynching of a Muslim university student in Khyber Pakhtunkhwa province, was because of the frustration over delay in Bibi’s execution. Pakistan’s National Assembly adopted a resolution condemning the lynching and resolved to insert safeguards into the blasphemy law but religious parties opposed the idea. Vatican Radio went on to say that since the passage of blasphemy laws in the early 1980s, religious minorities including Shia, Ahmadi, Hindu and Christians have often been attacked and persecuted for their faith. “ Asia Bibi ‎has been rotting in prison since 2009,” the outlet said. ‎”Such atrocities have become routine. The plight of Bibi has had a dampening effect on minorities. Their grief cannot be addressed because of religious retrogressive and extremist groups. Islamists consider her freedom a defeat for their movement,” added Shakir. 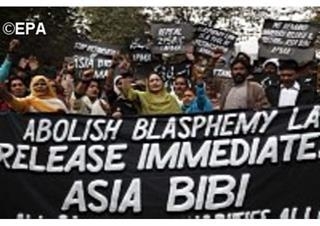 Photo Caption: 1) Supporters of Asia Bibi protest against the blasphemy laws. (EPA Photo). 2) Asis Bibi. 3) Michael Ireland.